With Chinese President Xi Jinping arriving in Washington D.C. today for meetings with his U.S. counterpart, President Barack Obama, much speculation has focused on what will come out of the summit. Amid the ever complicated bilateral relations, heavy media coverage, and thorny issues, such as cyber espionage, the yuan appreciation, and disputes in the South China Sea, will the much-anticipated meeting between the world’s two greatest powers make a real difference, or just be diplomatic etiquette that is business as usual? Behind all the hype and rhetoric, will the presidential “face time” produce any tangible deliverables? The popular narrative in the United States is that Xi’s trip won’t change anything in terms of the bilateral relations and disputes; whereas the Chinese press has been consistent in voicing high expectations for the summit. In my view, both takes are lopsided. Based on my observations over the last couple of weeks, I believe Xi’s trip could produce some major deliverables, at least some tangible results to showcase. Otherwise, both Beijing and Washington will have a hard time countering the public perception that the bilateral relationship is at a critical tipping point and will take a turn for the worse. The summit will further chart the course of the China-U.S. relationship, particularly the new model of major-country relationship, and discuss practical cooperation, while substantive results will come out of that. That is the official wording from China’s Foreign Ministry. My observation is that economic cooperation will be the major issue topping this summit’s agenda. More specifically, I expect some new progress should be made on the bilateral investment treaty (BIT) talks. From what I have learned over the last couple of weeks, negotiations took place both in Beijing and Washington respectively, right before Xi’s visit. And I learned that the Chinese side has made tremendous efforts in taking the BIT talks to the next level, although I cannot say too much about the specifics. In addition, last Wednesday, six days before Xi’s trip, 92 CEOs of major U.S. firms jointly wrote a letter to the Chinese president and his U.S. counterpart, calling for a high-standard, substantive negotiation on the BIT. The BIT could be quite beneficial in terms of unlocking new opportunities and leveling the playing field for U.S. firms and investors. Remember, one of the missions of Xi’s trip is to stabilize the increasingly complicated relations between China and the U.S. The China-U.S. commercial relationship has long been the bedrock of overall bilateral ties. The BIT, which is beneficial to both nations, could serve as a stabilizer to address sensitive and complicated issues emerging in the development of our bilateral relations. I think that’s part of the reason why Xi chose to kick off his U.S. visit in Seattle, which included his official interaction with the U.S. business community whose interests are closely interlinked with the BIT talks. In my opinion, one attainable result is that Xi and Obama make the announcement during the summit that China and the U.S. will finish the BIT talks within Obama’s presidency. If that’s the case, it would be a major tangible outcome. Apart from the BIT negotiations, I have seen some positive signs on the cyber security cooperation front for the past few weeks. I think it will be a bright spot coming out of the summit. Other deliverables may include progress on military cooperation and a follow-up on climate change. As for the maritime disputes in the South China Sea, I doubt there is much to talk about on that issue. Beijing can’t make any concessions, and Washington doesn’t expect Beijing to compromise. Although it is a major issue in the overall China-U.S. relations, I don’t expect it to figure prominently in the upcoming summit. Areas that I think will be discussed heavily, but which have received little coverage in either the Chinese and the American press, are such topics as NGOs and China’s economic reforms. China’s proposed new legislation on overseas NGOs has recently raised considerable concern in the U.S. It will be a hot topic during the summit. China’s market-oriented reform is also a major concern for Washington. Whether and how the reform persists will influence Washington’s strategic attitude toward China on other fronts, such as the South China Sea and cyber security issue. 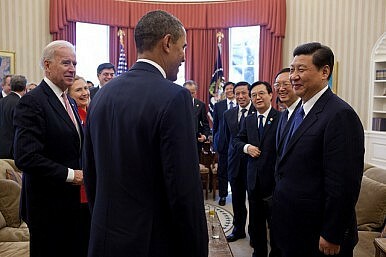 So I expect Xi to reassure Obama of China’s resolution to press ahead with reforms. The above is likely will be closer to the actual scenario, notwithstanding the popular usual coverage in the U.S. and Chinese media. Li Shengjiao is an expert on the U.S.-China issues and former Counselor of China’s Ministry of Foreign Affairs.